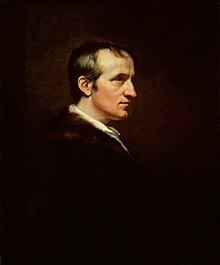 English political writer and novelist, considered one of the first exponents of utilitarianism, and one of the first modern proponents of anarchist philosophy. His first wife was Mary Wollstonecraft and their daughter was Mary Shelley. His second wife was Mary Jane Clairmont. "Godwin, William (1756-1836)," in Dictionary of National Biography, London: Smith, Elder, & Co., (1885–1900) in 63 vols.